Samsung has officially announced the new Galaxy Tab 2 and if it was a larger screen that you were waiting for, your wish has come true. Samsung will be launching two Galaxy Tab 2s: a 7” model which we already knew about and a larger 10.1” model. Mobile World Congress may not officially start until February 27th, but it seems that Samsung just couldn’t wait any longer to begin taking the wraps off of some of its new devices. Tonight the company announced a new 10.1-inch version of the Galaxy Tab 2 to compliment the 7-inch model that was introduced earlier this month. The Tab 2 has a dual-core processor, not quad-core like the ASUS Transformer Prime, and will ship with Android 4.0 Ice Cream Sandwich. Weighing in at 1.3 pounds, a hair heavier than its predecessor, the Galaxy Tab 2 10.1 is powered by a 1-Ghz dual-core processor and packs 1GB of RAM. The Tab comes with either 16GB or 32GB of internal storage. A microSD card slot offers support for up to 32GB of external storage space. Samsung will offer Wi-Fi only and 3G versions; no mention of 4G. 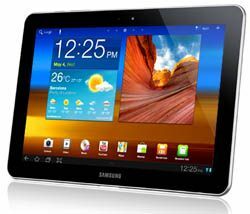 Several of the specs for the 10.1-inch Galaxy Tab 2 are similar to the 7-incher, meaning you’re looking at a 1GHz dual-core processor, 3-megapixel camera, VGA front-facing shooter and Android 4.0 Ice Cream Sandwich beneath Samsung’s TouchWiz UI. The 10.1-inch slate also packs a 1280×800 display, 16/32GB storage, 7,000mAh battery and optional HSPA+ connectivity. Samsung says the Galaxy Tab 2 series will begin their global rollout in the U.K. this March. There’s also a VGA front-facing camera or video chat, Bluetooth 3.0, and microSD expansion. The tablet is powered by Android 4.0 Ice Cream Sandwich with Samsung TouchWiz, Samsung Live Panel, and a variety of Samsung apps like Samsung Hub and AllShare Play. Samsung will launch the Galaxy Tab 2 series in March, beginning in the UK. We don’t have U.S. pricing or release date information yet. While the smaller tablet was announced a week ago, its big brother, the 10.1 is entirely new. It sports an 1280×800 resolution screen (the 7-inch model has a 1024×600 pixel screen), and the rest of the specs between the two tablets are nearly identical: a 1 GHz dual-core CPU, 1 GB of RAM, a 3-megapixel camera on the back and a VGA one on the front. We’re looking forward to trying the Samsung Galaxy Note 10.1, a tablet including the S-Pen stylus and stylus SDK of the smaller Samsung Galaxy Note, a jumbo-size smartphone with a 5.3-inch screen which is being named as phablet by many people out there. We’re hoping the fact we’re seeing a re-badged model from last year means we’ll be getting something of a price plunge too – given the first Tab 10.1 can be had for around £360 now, a sub-£300 tag would be just lovely. We have been given a Galaxy 2 10.1 UK release date of March, so not long to wait now.